The greater wax moth Galleria mellonella and lesser wax moth Achroia grisella, are estimated to cause more than $5 million worth of damage a year in the USA alone. Its larvae feed on impurities in wax, pollen and even bee larvae and they can destroy comb very rapidly. Damage is most frequently found in stored comb, but weak colonies can also succumb. Vita has a highly effective biological wax moth treatment: B401. 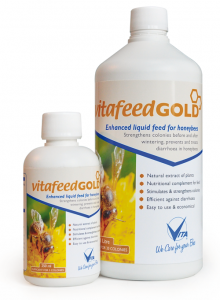 Vita Feed Gold will help keep colonies strong and healthy. Wax moth numbers are usually kept under control by healthy colonies, but in weakened or abandoned hives or stored frames, wax moth populations can soar. It is the larvae and not the adults which eat the pollen and comb and do the real damage. Where there is severe infestation, all four life stages can be found, along with tunnels of silk throughout the combs, and deposits of dark faecal matter. Very quickly, all that will remain is gritty debris of comb remnants on the bottom board, and cocoon attachments. Little or no comb survives intact after a wax moth infestation. 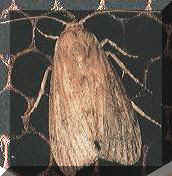 The adult greater wax moth is greyish brown and has a wingspan of around 3 cm. The lesser wax moth is a white-silver colour and is smaller. The moth life cycle consists of four stages. The first stage, the egg, is tiny and, usually goes unnoticed. Eggs are usually laid in cracks between hive parts in batches of up to 300. In five to eight days, wax moth eggs hatch to the second, larval, stage. Larvae burrow into the beeswax comb and feed for one to five months, depending on the temperature. Fully-grown larvae have a dark, hard head capsule, three pairs of segmented legs, and several body segments. They are initially white, turning dark grey with age, and up to 2 cm long. Wax moth larvae live on impurities in the comb (rather than, as their name suggests, the wax itself), and so prefer to live on comb that has been used for brood rearing. Foundation is rarely consumed, but in capped honey, young larvae tunnel just below the cappings, which causes harvested honey to leak, and comb honey to become less attractive. Fully-grown larvae form cocoons either in the comb debris or, more commonly, attached to the frame or hive body. Larvae chew cavities in which to cement the cocoons, and lasting damage is done to the frame. Adult wax moths have acute sensory capability to find and exploit beeswax. They readily enter beehives to lay eggs, but the bees can usually keep their numbers under control. Adult wax moths have atrophied mouths, do not feed, and so cause no damage. Adult wax moths and larvae can, however, act as vectors for the transfer of serious bee diseases such as foulbrood. Ensuring strong colonies is the best way to control wax moth in a colony. The comb of weak colonies and colonies without queens can be destroyed in less than one month. • make sure bees can access all parts of the hive – and be able to see off wax moths. Vita’s B401 (Certan) is a biological wax moth control that gives 100% efficacy. 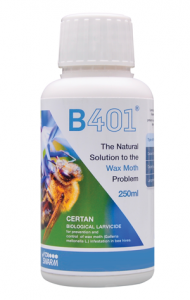 B401 produces a natural toxin that attacks only the moth larvae. The larvae ingest the spores of B401 which then germinate in the gut and release the toxin which destroys the gut lining, killing the larvae. The reproductive cycle of the wax moth is therefore stopped. Storing comb especially in warmer climates increases the risk of wax moth attack. Storing in plastic bags is usually ineffective because wax moth eggs are often already present and storing outside only works if temperatures are low enough. PDCB (paradichlorobenzene) crystals should definitely not be used because they are toxic to humans and honeybees and leave residues in wax and honey.